Over the 4th of July holiday weekend, the hubby and I took a spontaneous trip to Itasca State Park. Now, we have been to MANY state parks, but Itasca is by far the best we’ve ever experienced. Located in northwestern Minnesota, this park is the oldest in the state. Founded in 1891, the park offers year-round camping (most with electrical hook-ups), a lodge with a restaurant (the french toast is scrumptious), rental cabins, and that’s just the accomodations. 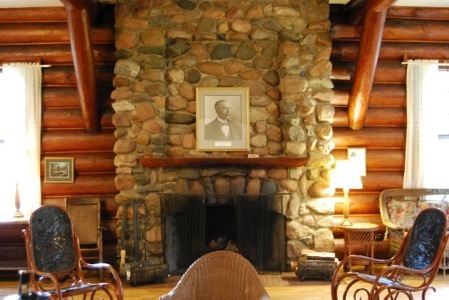 The main room at Douglas Lodge. Named for former Attorney General Wallace B. Douglas who was a pivotal figure in the battle to save timber in the park at the turn-of-the-century. The lodge was built in 1905. 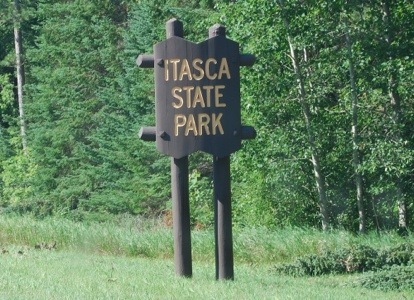 Itasca State Park is set on 32,000 acres and contains 100 lakes. Lake Itasca, which is crystal clear, has a fabulous beach and the best changing rooms/showers I’ve ever used. The sports facility offers the rental of bicycles, boats, and other outdoor recreational equipment. There are several boat launches and it’s quite nice to paddle to the lodge for a meal. 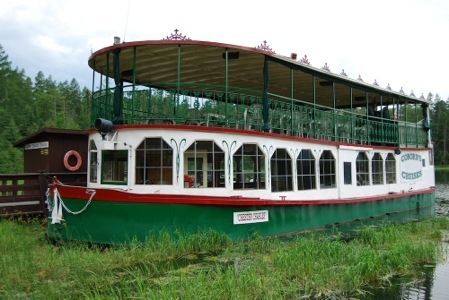 Lake Itasca Tours offers a 2-hour boat excursion on the Chester Charles II. The lodge will pack you a picnic lunch or you can purchase snacks and beverages on board. 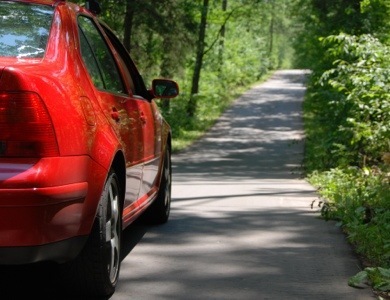 Wilderness Drive is a 10 mile stretch that takes you through the heart of the forests. Beautiful winding road with plenty of wildlife and nature. Gorgeous! 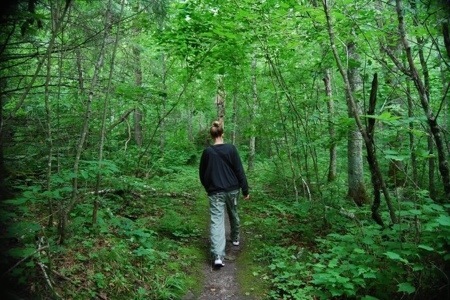 There are so many hiking trails there’s no way you can experience them in one trip. We took the Dr. Roberts trail. This trail winds for 2 miles through forest and bogs. There is also the Old Timer’s Cabin on a point that was once used for honeymoons. It is only 4 logs high! On the trail. So tranquil, but the flies were stalking me! There was a huge storm a few days earlier and there were many trees down. It didn’t matter-I would have found my way around anything to get away from the bugs! 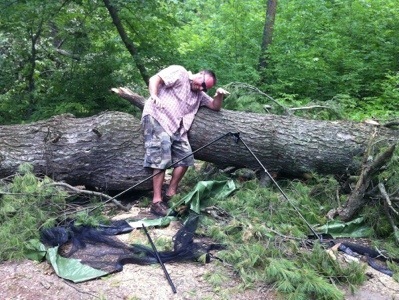 The storm knocked a tree onto a tent (no one was hurt). The hubby goofing off! 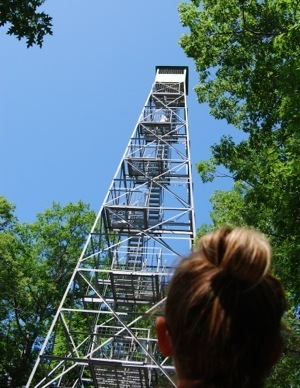 The park also features the Aiton Fire Tower. 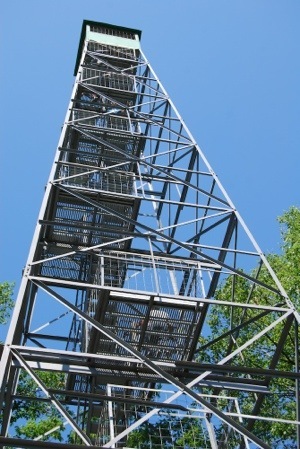 This 100 foot tall tower, which was restored in 1998, is worth the climb. The view is amazing. You can see over the top of the forest, spot the lakes, and really appreciate the wonder of nature. Only 6 people can be on the tower at a time. I didn’t think I’d make it to the top, but I am so glad I did. Guido 100 feet up. Look at that view! I’m trying to summon the energy to climb 100 feet! 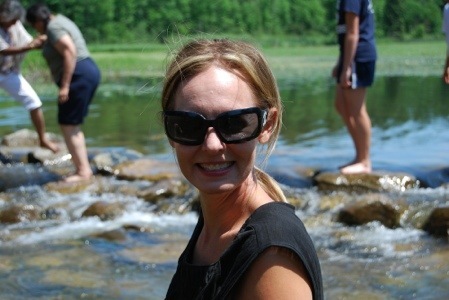 One of the really special points of the park is the fact that the headwaters of the Mississippi River are located here. Here the mighty Miss begins her 2552 mile journey to the Gulf of Mexico. It’s quite spectacular. Very small, very clear, and full of people! Some were swimming, some were wading, and others were walking across the slippery boulders. Can you tell the hubby is a writer/photographer? Look at all that gear! The rocks were way too treacherous for me, but there were plenty of others willing to give it a go. We always stop to listen to the demonstrations. 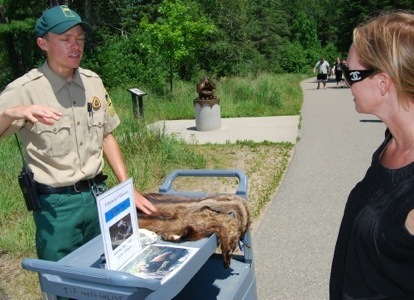 Here, a young park ranger teaches me about fishers. After a day of exploring, we headed back to our camp. 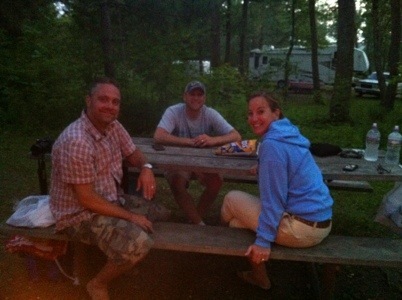 One of the best parts of the trip was that our good friends live close by. They came over to hang out with us for the evening. Best buds, campfire, and being outdoors. Makes for a very enjoyable evening! If you’re looking for a wonderful place to camp and explore, I highly recommend Itasca State Park. It’s a true gem! 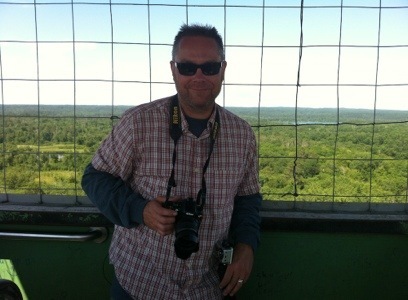 We live only 30 minutes from Itasca and have been there many times but always find something new to explore. I went there at the beginning of May with my Dad and did the bike trail. Fun and hilly. It truely is an amazingly beautiful State Park! Thanks for sharing the great photos. We have to go again!! Looks like a wonderful time! How lucky we are to have such beauty right here in our litte state.